At Durlacher Dental Care, we put our patient’s needs first. We strive to be able to provide each and every patient with all the options to give them the confidence and knowledge to make informed decisions around their oral health. We want our patients to have complete confidence in us to deliver them with the highest quality of dental care. It is common practice within the dental profession to encourage patients to attend for regular dental check-ups. These regular visits are essential in maintaining dental health and diagnosing problems in their early stages - in our experience, treating a dental problem in its early stages is quicker, easier and less expensive. At Durlacher Dental Care we recommend and provide ongoing care including regular check-ups, radiographic assessment and continual oral hygiene care. This is available to each and every patient and in many cases you may only need to visit once or twice a year. We all know that general wellbeing and resistance to disease or infection depends a lot on healthy eating and a balanced diet. But are you aware that your eating and drinking habits can also effect the health of your teeth? Foods that contain sugar can greatly contribute to tooth decay. Almost all foods, including milk and vegetables have some type of sugar, so to help control the amount of sugar you consume you should read food labels and choose foods and beverages that are low in added sugar. Added sugars often are present in soft drinks, lollies, biscuits and pastries. Acidic foods can also cause damage to your teeth; wine, soft drinks, fruit juice, citric fruits all can cause acid erosion to your enamel. This can result in sensitivity and promote tooth decay as well. Minimising these types of foods or limiting them to your main meals can reduce the damage they cause. Drinking water following their consumption can also reduce the effects of the acidity on your teeth. If you would like to know more about how your diet could be affecting your smile, please don’t hesitate to ask us at your next visit. A fear of the dentist is extremely common. Many people avoid attending the dentist purely due to fear, whether it be due to a bad experience as a child or maybe due to the sounds, smells and sensations of being at the dentist. 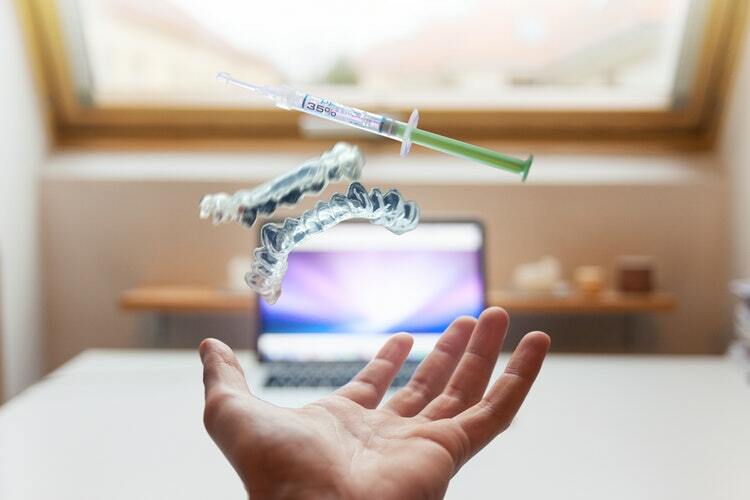 If you’re one of those people who get a shiver up their spine when picturing themselves in the dental chair then a form of sedation for your dental treatment may be a great option for you. The range of sedation varies, from a light level of sedation, which helps to ‘take the edge off’, to being fully asleep and in hospital with an anaesthetist. The appropriate level of sedation depends entirely on you and what you think would be best for your peace of mind. If being asleep for your dental treatment is desired (and is generally recommended for invasive procedures such as wisdom teeth removal, Durlacher Dental Care can arrange to have your treatment performed under a General Anesthetic at either the St John Of God Geraldton Hospital or at the Geraldton Regional Hospital (GRH). There are limitations imposed by the GRH such as a waiting period for a surgical time allocation. As a private hospital St John of God Hospital often provides a theatre time sooner. We recommend that any patient interested in being fully asleep for their dental treatment first comes in to our clinic to have a consult. In this consult we will have a look inside your mouth and formulate a personalised treatment plan with you. This is a straightforward appointment as most of the time is spent chatting and discussing your treatment options, helping you to be put at ease and relax you ahead of your dental treatment. Our receptionist will liaise with a local anaesthetist to arrange your sedation, making the process streamlined and minimise further concern or anxiety. Keeping healthy teeth and gums are the benefits of regular visits to your dentist. There’s no doubt some people are lucky with their teeth – they rarely seem to need fillings or other dental treatment, and can happily skip brushing without any apparent ill effects. For the rest of us, it’s a different story – the condition of our teeth is directly related to the amount of effort we put into cleaning our teeth and on maintaining our oral hygiene. Cut down on soft drinks, cordial and fruit drinks. Just as importantly, keep up those regular visits to your dentist. Remember, there’s more to your routine dental examination than just checking for decay. Your dentist will evaluate the health of your gums, take a look at your bite, check for damaged fillings and examine your mouth for any signs of oral cancer, diabetes and vitamin deficiencies. What this means is that most problems can be identified at an early stage, before small issues become big problems needing major treatment. Like the old saying goes, “a stitch in time saves nine”, meaning addressing a problem early on may save you a lot of pain, cost and time in the future. Dental decay is not the only disease we are aiming to prevent and treat through your regular dental check-ups - gum disease is another major dental disease that can cause tooth loss if not prevented. At your check up appointment the dentist will scale and clean your teeth; this removes plaque and calculus that’s out of reach of the toothbrush. The dentist will then polish your teeth, removing any surface staining. This isn’t so you don’t have to bother to clean your teeth when you get home – it’s all part of a strategy to help you avoid gum disease and serious periodontal issues. If you meet with an unexpected problem, emergency dentistry is available for you at Durlacher Dental. If you are suffering from any of the above and require seeing a dentist urgently, please do not hesitate to give our surgery a call and we will assist you as best we can. The term oral surgery is used to describe the use of surgical techniques to treat diseases, injuries and defects in the hard and soft tissues of the mouth. A number of conditions may require dental surgery – the most common is generally impacted teeth, a problem that is frequently associated with developing wisdom teeth. If the jaw is large enough to accommodate the growing wisdom teeth, these teeth emerge from the gum line normally. However, in some cases a tooth may fail to emerge in proper alignment or fail to fully emerge through the gum line and become entrapped or ‘impacted’ between the jawbone and the gum tissue. Impacted wisdom teeth can result in swelling, pain, and infection of the gum tissue surrounding the teeth. In addition, impacted wisdom teeth can cause permanent damage to nearby teeth, gums, and bone, and sometimes lead to the formation of cysts or tumours that can destroy sections of the jaw. Therefore, dentists often recommend people with impacted wisdom teeth have them surgically removed. Wisdom teeth removal is not a particularly pleasant procedure, however the dentists at Durlacher Dental Care are very experienced with all facets of oral surgery and will make the process as pleasant as possible. We are able to offer various forms of sedation to relax you in the appointment, with information about our sedation options available here. Holding on to your teeth for as long as possible is the aim of modern dentistry. But what happens if there’s nothing for your teeth to hold on to within the jaw? The disease in which the supporting structures of the teeth are lost is called “periodontitis”, and it is both preventable and manageable in the dental surgery. Gum disease can occur when dental plaque and calculus builds up on the teeth. 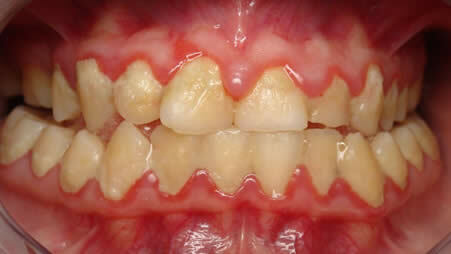 The early signs of gum disease, known as “gingivitis”, are bleeding, redness and swelling of the gum. If this isn’t treated, the gum weakens, and pockets form around the teeth. Bacteria then gets into these pockets, causing further inflammation, which can then attack the bone supporting the tooth root. As bone is lost, larger spaces begin to form between the tooth and the gum, resulting in bad breath, food getting stuck in between the teeth, bad tastes in the mouth, and ultimately loose teeth. In certain cases of gum disease, a specialist called a “periodontist” may be needed to help you avoid premature loss of otherwise healthy teeth. He or she can help remove plaque and calculus that can’t be reached by normal brushing, and regular maintenance visits may be necessary, as gum diseases tend to recur. Like any dental therapy, the sooner the condition is identified and treated, the better and longer lasting the results. Whilst careful cleaning with a soft brush, especially along the gum line, will help prevent gum disease, your dentist is the best judge of whether a special periodontal visit is necessary, hence the need for regular dental check-ups and why prevention is better than a cure. A dental crown is a tooth-shaped ‘cap’ that is placed over a tooth to restore its shape, size and strength. The crown, when cemented into place, fully encases the visible portion of a tooth that lies at and above the gum line. Crowns can be made entirely out of ceramic or out of a metal such as gold, and sometimes both metal and ceramic are used to fabricate a crown. Dental bridges literally bridge the gap created by one or more missing teeth. The missing tooth, known as the ‘pontic’, is supported by crowns on one or more of the teeth adjacent to the gap. Bridges can also be supported by implants and are often used in the replacement of multiple missing teeth - please see our section on implants for more information. The purpose of a bridge is to replace a missing tooth. By doing this, we are able to maintain the shape of the face and mouth, to restore the ability to chew and speak properly, to distribute the forces in the bite more evenly and to also prevent the remaining teeth from drifting out of position. There are three main types of dental bridges. The first, traditional bridges, involve creating a crown for the tooth or implant on either side of the missing tooth and putting a replacement tooth in the middle. The second, cantilever bridges are where only one adjacent tooth is used to support the replacement tooth, and finally resin-bonded bridges where instead of a crown, a metal or porcelain ‘wing’ on one side of the replacement tooth is bonded to your existing tooth. The different tooth replacement options are complex and varied and your individual situation needs to be considered before the appropriate treatment plan can be made. At Durlacher Dental Care we are fortunate to work with extremely experienced and knowledgeable dental technicians who have the ability to make your crown look almost identical to your natural teeth. Our dental technicians are located right here in Western Australia, and we are proud to work with Australian dental technicians using state of the art materials and equipment. Are you afraid to yawn and show off a mouth full of dark, discoloured amalgam fillings? White fillings are much less obvious and we find many patients prefer them – especially for those teeth that are on show at the front of the mouth. White fillings not only provide beautiful restorations that look very natural but they also bond to the original tooth, adding structural strength and protection against further fracture that amalgam doesn’t provide. Although used much less than in the past, amalgam still has a place in dentistry. While there are articles on the internet suggesting health problems associated with amalgam, good scientific studies have in fact shown no evidence of any effects on general health. We are, however, fortunate that we are trained in the use of more aesthetic materials that are available to us today. White fillings can come in two types - plastic or ‘composite’ fillings, or ceramic fillings. Plastic fillings are used routinely due to being readily available, and can also be placed to look very natural. Ceramic fillings are much stronger than plastic fillings and generally have a better lifespan. Ceramic can also be used to create strong crowns and veneers which can look almost invisible to the untrained eye! A Veneer is a thin layer of ceramic material that is bonded to the front of a tooth. Veneers are commonly used to adjust the shape, contour and colour of front teeth. It has been shown that a veneer can actually strengthen a tooth when bonded to it. The process is very conservative in that only a fraction of the tooth is prepared to accommodate the veneer, and can make an incredible difference to a person’s smile. Creating an environment in which children enjoy attending the dentist is very important to us at Durlacher Dental Care. We endeavour to make visits to the dentist a pleasant experience, in the hope that a positive dental upbringing will result in good oral hygiene habits and a life of good dental health. With an emphasis on achieving a pleasing aesthetic result. Our dentists are experienced with different approaches to cosmetic dentistry. A number of different procedures are commonly used in what is considered “cosmetic dentistry”, such as veneers, crowns, the use of white fillings to replace discoloured fillings, bleaching and braces. For more information on each topic, please visit the relevant section. Your dentist may recommend root canal therapy, otherwise known as “endodontic treatment” for a painful tooth. This process involves removing inflamed or dead dental pulp, which is the soft tissue in the centre of a tooth that contains nerves, blood vessels and lymphatic vessels. When the pulp cannot repair itself from disease or injury, it dies. A fracture in a tooth or a deep cavity may cause pulp death, and consequently after the death of the pulp it may become infected. An infected pulp may causes abscesses, loose teeth and a lot of pain, and even loss of the tooth if the infection is left long enough. Root canal treatment is the way to not only prevent the infection from occurring but also to treat the infection when it is present. A fully-formed tooth can function normally without its pulp and can be kept for a long period of time. After removing the pulp, the root canals are cleaned, sterilised and shaped to a form that can be completely sealed with a filling material to prevent further infection. The treatment can take several appointments, depending on how complex the tooth is, and how long the infection takes to clear. Subsequently a crown or complex restoration to restore or protect the tooth may be necessary, as a tooth is more likely to fracture after undergoing a root canal treatment. Whilst at times complex and time-consuming, root canal treatment makes it possible to save a tooth that would otherwise have been lost. The decision on whether to perform a root canal treatment on a tooth or not is complex and depends on a variety of factors. To find out more about your dental treatment options we encourage you to speak to your dentist. A denture is a removable replacement option for missing teeth. Two types of dentures are available – complete and partial dentures. Complete dentures are used when all the teeth are missing, while partial dentures are used when some natural teeth remain. Complete dentures can be either ‘conventional’ or ‘immediate.’ Made after the teeth have been removed and the gum tissue has sufficiently healed, a conventional denture is ready for placement in the mouth about eight to twelve weeks after the teeth have been removed. Unlike conventional dentures, immediate dentures are made in advance and can be inserted as soon as the teeth are removed. As a result, the wearer does not have to be without teeth during the healing period. The bone and gum supporting a denture shrinks over time, especially during the healing period following tooth removal, so immediate dentures require much more adjustment and maintenance to ensure an adequate fit during the healing process. Consequently, immediate dentures will require a “reline” after a period of three to six months, which helps to improve the fit of the denture after the tissues have shrunk down. 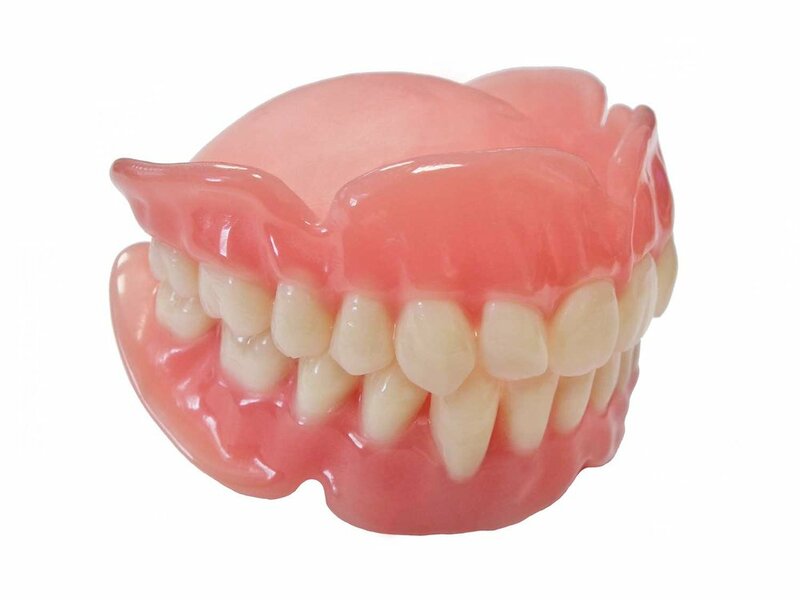 A partial denture consists of replacement teeth attached to a gum-coloured plastic base, which is sometimes connected by metal framework that holds the denture in place in the mouth. Partial dentures are used when one or more natural teeth remain in the upper or lower jaw. Dental implants can be used to make dentures (usually lower) more stable. Dental implants are a great way to improve the stability of dentures, however not everyone is a suitable candidate to have them placed. We recommend taking the time to talk to your dentist about what the best option is for you as no two mouths are the same. Many Midwest sporting clubs require participants to wear mouthguards whilst playing and training. 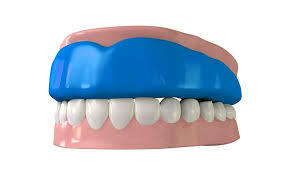 The Australian Dental Association (ADA) recommends that only a professionally custom-fitted mouthguard should be worn. Keep your mouthguard clean and store it in a rigid container, away from heat to ensure it maintains its shape, and check your mouthguard every twelve months for optimal fit and protection. Excessive clenching or grinding of teeth that is not part of normal chewing is known as bruxism. This is a habit (more prevalent during sleep) that can lead to accelerated wear and fracture of teeth and can also result in pain in the jaw joints and muscles of the jaw. A common treatment is the use of an occlusal splint (sometimes referred to as a night guard) which markedly reduces the amount of grinding and clenching and also serves to protect the teeth from further damage. If excessive tooth structure is lost due to bruxism, the teeth may become sensitive and painful, so prevention of the consequences of bruxism is much preferred instead of dealing with the issues after the damage has been done. Orthodontic treatment can straighten overcrowded or overlapping teeth. Orthodontics is the branch of dentistry that corrects teeth and jaw problems with braces and plates to properly align the teeth. The teeth whitening tray system has become very popular, and a lot of the smiles you see are as a result of this. When you watch a movie, what’s the first thing you notice about any Hollywood actor? Is it the gorgeous hair, the beautiful eyes, the smooth skin, the wonderful clothes? If you’re a dentist, of course, the first things that catches your eye are those pearly white teeth. But let’s be honest about it, those teeth didn’t just happen – more often than not there has been some whitening involved! There’s no doubt that neither our modern lifestyles nor the ageing process are particularly kind to teeth, and they will darken and stain as we age and live. But they don’t have to stay that way – if you’re someone that values having a bright and white smile, there’s a procedure that you can use at home to achieve it. Here’s how it works: we take an impression of your upper and lower teeth and use this to make a specially designed tray which fits snugly over your teeth. At home, you fill this tray with a whitening gel for two hours a day for two weeks. A close fit means the gel stays in contact with your teeth in the appropriate spots. It’s not a one-off procedure – over time new staining will occur – but with your tray you can repeat the procedure whenever you feel your dazzling whites need a refresh. An alternative to whitening is to have veneers done, another way of achieving a brighter and whiter smile. Dental implants are an option to replace a missing tooth or a number of missing teeth. They can also be used as an alternative to bridges and dentures. Dental implants are tooth root substitutes that are surgically anchored in place in the jawbone and act to stabilise the artificial teeth to which they are attached. Suitable candidates for dental implants need to have an adequate bone level and density, and must demonstrate excellent oral hygiene.